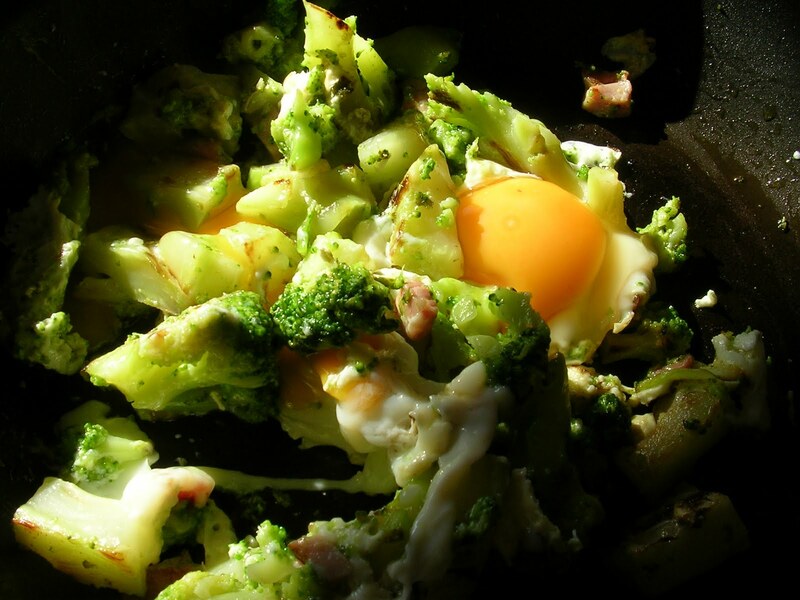 Revuelto is eggs scrambled with vegetables. My favorite flash-in-the-pan lunch dish is revuelto. Revuelto means “scrambled.” But the dish is more than simple scrambled eggs. It starts with a sofrito of garlic, ham and vegetables. Then the eggs are scrambled into the sofrito. Ajetes are green garlic shoots. 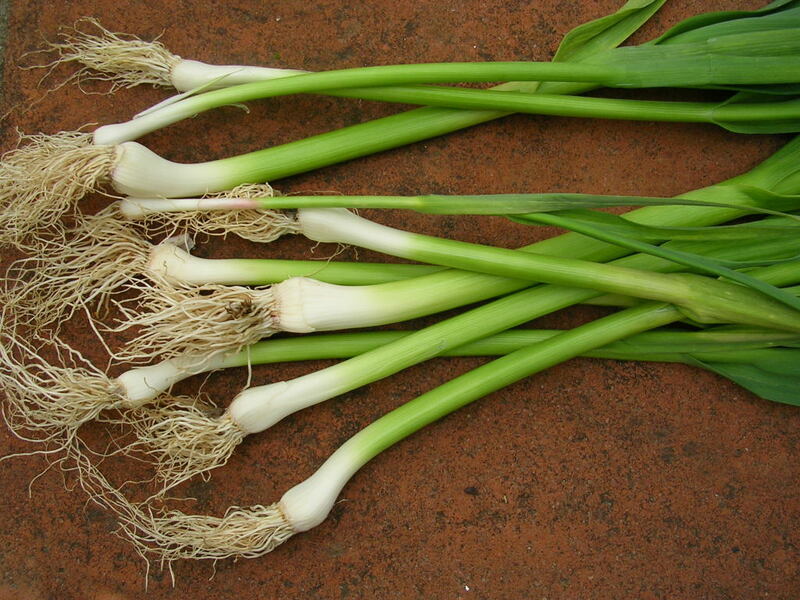 Today the garden yielded a bunch of ajetes, green garlic shoots. Green garlic shoots look like spring onions. 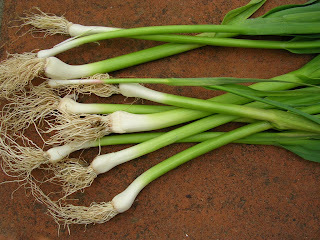 The embryonic garlic bulb is not yet divided into separate cloves and the green tops are tender enough to use raw. Both white root and green tops go into the revuelto. Green garlic has a mild flavor without the bite of mature garlic. In another few weeks, I’ll be cutting palotes, garlic scapes, the flower-bearing stems, so that the bulbs continue to fatten, until harvest in June. 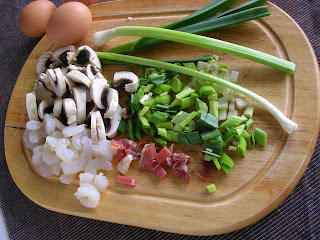 Ingredients for revuelto--eggs scrambled with green garlic, mushrooms and shrimp. 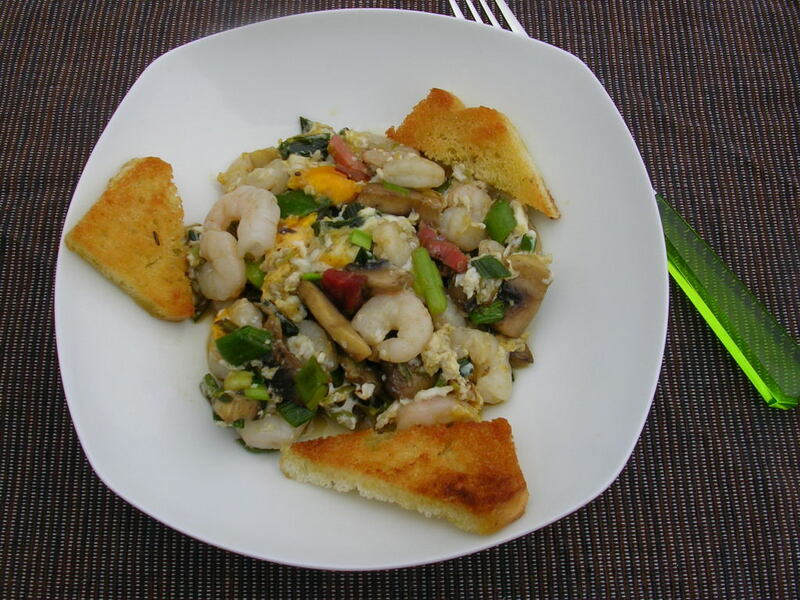 In the kitchen, I found mushrooms and ham scraps in the fridge, shrimp in the freezer and free-range eggs. Some olive oil in a skillet, chop the garlic shoots. Lunch in a jiffy. Or breakfast. Or supper. When I make revuelto, for one person or several, I usually break the eggs right into the skillet with the sofrito of vegetables and let them cook a minute as if they were fried eggs, then push them around to “scramble” the eggs with the other ingredients. But, if you prefer, beat the eggs in a bowl and stir them into the sofrito. Favorite fast lunch--revuelto with shrimp and green garlic. In Spain this dish is made with any one of several types of wild mushrooms, but you could use cultivated white mushrooms instead. Makes 6 tapas or 3-4 lunch servings. Cut away any woody parts of the mushrooms, rinse under running water and pat them dry on a kitchen towel. Slice the mushrooms. Trim away ends of garlic shoots and chop them, including the green tops. Heat the oil in a skillet and sauté the mushrooms and garlic until softened. Add the prawns and sauté 1 minute. Stir together the water, eggs, salt and pepper. Pour the eggs into the mushrooms and cook, stirring, until eggs are set creamy-soft. Serve immediately with fried bread. Love it! And love scrambled eggs for lunch. It's the perfect meal--and even better when well stocked.